Plataine was granted the award for its innovative Industrial IoT and Artificial Intelligence (AI)-based technologies. The 7th Annual Aviation Industry Summit 2017 has announced the winners of its 2017 industry awards at a prestigious Gala Evening Award Ceremony in Shanghai. 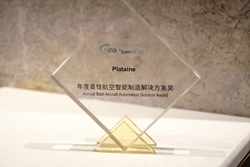 Plataine was granted the award for its innovative Industrial IoT and Artificial Intelligence (AI)-based technologies as well as the successful solution implementation at Harbin Hafei Airbus Composite Manufacturing Centre (HHACMC, Harbin, China). The award was granted by the Shanghai Society of Aeronautics (SSA) which aims to encourage the development of China’s Aviation Industry, to promote the nurturance of talents in this field and the integration of aeronautic technology within the Chinese economy. Plataine is the leading provider of Industrial IoT and AI-based optimization solutions for advanced manufacturing. Plataine’s solutions provide Material & Asset Traceability and Digital Assistants that empower manufacturers to make optimized decisions in real-time, every time. Plataine’s patent-protected technologies are used by global top-tier manufactures including Airbus, GE Aviation, General Atomics, Hexcel, IAI, TPI and Steelcase. Plataine partners with Siemens PLM, GE Digital, McKinsey & Company and Google Cloud to further promote Industrial IoT in manufacturing worldwide.